From left to right stand Gallipolis Police Chief Jeff Boyer and Gallipolis Patrolmen Scott Adkins, Shane Plantz and Gary Waldren. The three patrolmen hold their Life-Saving Awards for efforts in breathing life back into a man who had no pulse, last November. 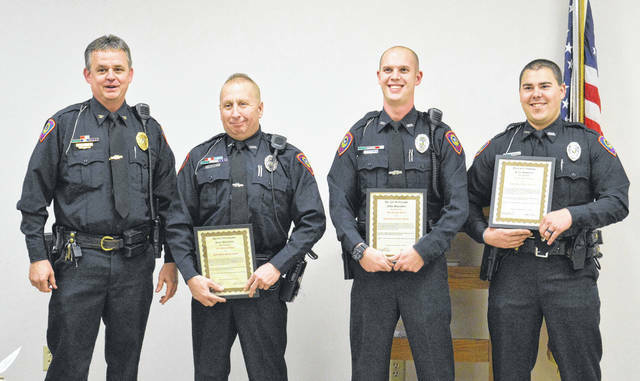 GALLIPOLIS — Three Gallipolis police officers were honored Tuesday evening at the Gallipolis City Commission meeting with the city’s Life-Saving Award for resuscitating a man last November. Boyer said he was later contacted by Gallia EMS and told that a paramedic had said that were it not for the officers actions that night, the patient would have likely not survived. “That being said, I’d like to take a minute to recognize these guys with the Life-Saving Award and a ribbon for their uniform,” said Boyer. Boyer said Plantz was receiving his second Life-Saving Award and had been with the department for less than five years. Adkins received his second award within 20 years of service. Waldren received his first award and has been with the department for less than two years. The three patrolmen were greeted with a standing ovation from city officials and area residents. Dean Wright can be reached at 740-446-2342, ext. 2103, and the Gallipolis Daily Tribune Facebook page.